Dawn & Brian | Love It or List It Galleries | Merit Kitchens Ltd.
Jillian illustrates how cabinetry can be used throughout the home for a cohesive look, in Dawn and Brian’s episode. 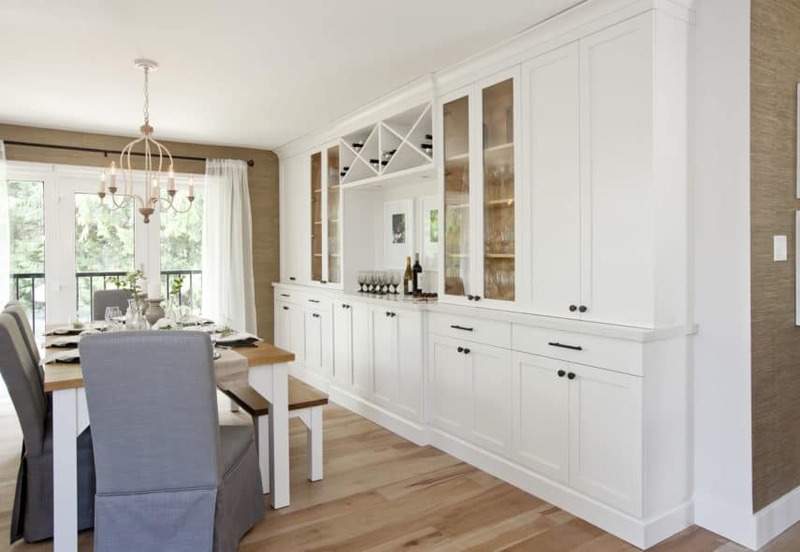 The Frost white, Painted MDF Manor Flat cabinets from the kitchen are also used in the dining room to create a sideboard, wine bar, china cabinet, and pantry all rolled into one. The wood interior of the glass cabinets is kept natural to tie-in with the floor, and provide visual relief from the otherwise all-white cabinetry. Finally, criss-cross wine racks provide an interesting, geometric touch.